My friend Kelly and I went out for Thai this past weekend. I absolutely love, love, love Pad Thai with chicken and shrimp. Yum! But this was my very first time trying a Thai dessert. My taste buds were in heavenly delight as I enjoyed Cocunut sticky rice with mango slices on the side. Oh my! I discovered this recipe below. I'm going to try it out this week and can't wait to see if it lives up to the scrumptiousness I experienced the other night. 1.) Rice: Cook rice according to package directions, but substitute coconut milk for half of the water, and add half the sugar. 2.) It should be fairly dry when you finish cooking it, without any liquid visible in the pot. 3.) Sauce: In a medium saucepan, boil the rest of the coconut milk with the second half of the sugar. 4.) Keep this at a full boil until the rice is cooked, or until it reaches a thick, syrupy consistency. 5.) 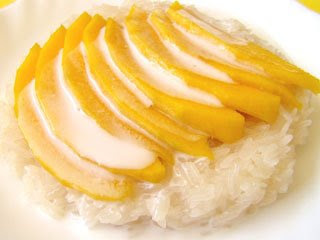 Presentation: Arrange the cooked coconut rice in a bowl or plate with the mango slices in some kind of pretty formation and pour some of the sauce over the whole thing. You can top it with a few sesame seeds. I can't wait to try it too. It looks delicious.